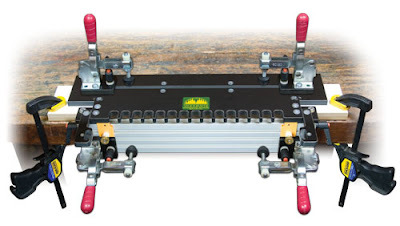 The Porter-Cable 4212 Deluxe 12" Dovetail Jig is the evolution of the Model 4210. It excels at producing perfect 1/2 blind dovetails, but better is the fact that P-C added an additional CNC machined aluminum template for through dovetail and box joints! 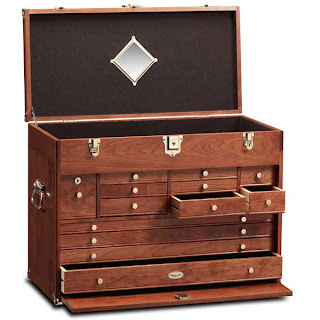 This blog (short for Web Log) features information and links to high-quality dovetail and joinery jig and machines and items that are related to these tools which are for sale on the web. 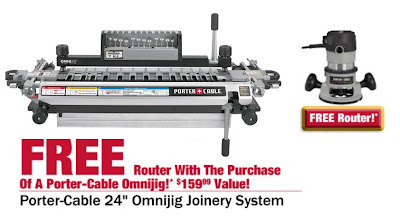 A Killer Deal on the Porter-Cable 24" OmniJig, with a FREE P-C 690LR router! If you haven't had a chance to see the new Porter-Cable Omnijig in person yet you owe it to yourself to do so soon. The OmniJig was first introduced in 1989 and believe me, it was a battleship! I own both a 18" and a 24" version of the original and they have been workhorses. I really hate to admit this, but this new Omni-Jig dovetail router jig kicks the snot out of the original! The first thing that will catch your eye is that this is MASSIVE! My guess is the 24" capacity jig has got to be over 3' long! The next thing you'll notice is that it has an adjustable template, meaning it can be used to make variable spaced dovetails. All the stops are factory preset, but these can be tweaked once she's in your shop. Check-out the videos below for lots more info, but please be aware that Woodcraft is offering the 24" OmniJig in the month of April 2010 with a FREE Porter-Cable 690 router! This is my all-time favorite router, which might explain why I own so many of them! Click this Woodcraft.com link to see the deal while its still available. The AKEDA DC-16 from AKEDA Jigs Incorporated is one of the newest jigs around and takes a unique approach. Without any adjustments this jig promises variably-spaced through dovetails on the first try. In addition to no adjustments, excellent dust collection, virtually no setup, dovetail layout is easy and repeatable. Woodcraft is the exclusive distributor the AKEDA DC-16. Click the picture below to see the Akeda at Woodcraft. Click the picture to see the Akeda at Woodcraft. The Leigh dovetail jig Leigh Industries is considered one of the best jigs on the market. The Leigh cuts infinitely variable tails and pins and also offers an dizzying array of accessories that allows you to mill mortise and tenons, a variety of box joints, and decorative joints. Click the picture below to see Leigh dovetail jigs at Woodcraft. 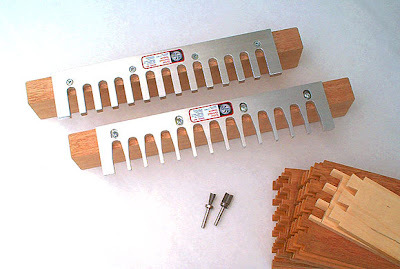 Click the picture to see Leigh dovetail jigs at Woodcraft. 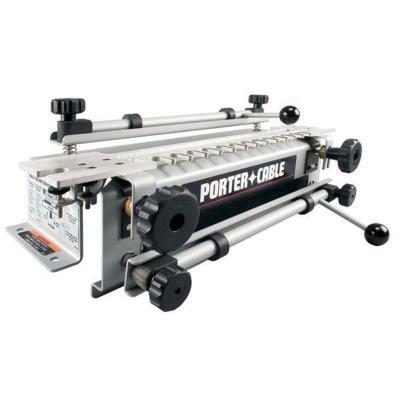 The Porter Cable dovetail jigs are among the most popular jigs on the market. 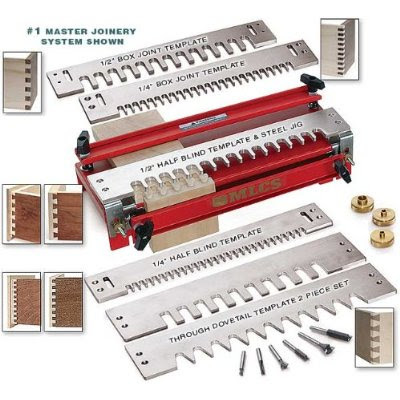 Porter Cable offers a variety of optional templates to compete with the Leigh as being the most versatile dovetail jig available. Click the picture below to see Porter-Cable dovetail jigs at Woodcraft. Click the picture to see Porter-Cable dovetail jigs at Woodcraft. 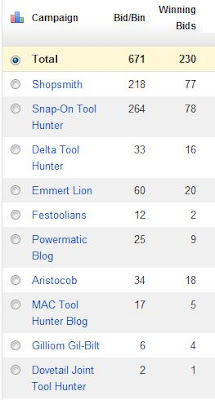 Seeing that Festool is known mostly as the Mercedes of powertools, it should come as no surprise that they also have a fantastic dovetail jig. Watch the video below. The Keller is one of easiest to use through Dovetail jigs, though they offer only fixed pin and tail spacing. 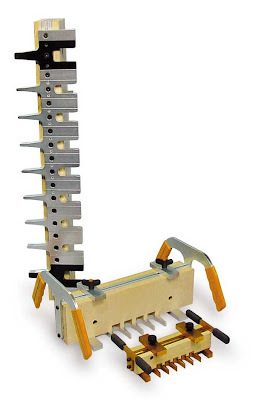 The Woodrat is perhaps the most unique dovetail jig on the market, and appears to have the largest learning curve. I have not used the jig, but it gets high points for versatility and creative capacity. Setups appear to be more complex than typical jigs. The Woodrat runs around $500. The GFK 1200 is another P-C look-alike for $100, while the GFK 1800 starts around $150. Hartville sells aftermarket cam-action clamps for the 12378 that also fit the P-C 4112. 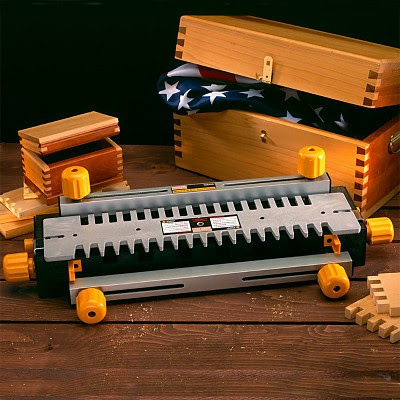 At first glance you'd think you were looking at the Woodstock International jig, but despite a few common elements the Rockler Dovetail jig is head and shoulders beyond the Woodstock. Not only is this jig capable of cutting normal half blind dovetails, but with standard accessories it will cut through dovetails as well. Optional templates are available for mini half-blind dovetails too. One of the nicest innovations is something that used to drive me nuts with the Woodstock jig. On the Woodstock jig you have two stops on each side of the jig that must be adjusted just right in order to prevent misalignment when you assemble your joints. 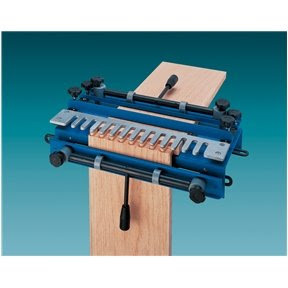 Rockler has added a simple one piece stop on each side that is always square and which is preset for the correct offset. That makes it almost impossible to mis-align your boards. 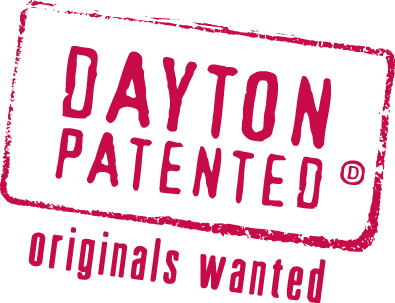 Very slick and Rockler even has a patent pending on this innovation. One new innovation is a slick little duct collection chute which attaches to their jig for a much cleaner shop. Patented in 1983 and introduced as The Wirth Machine, the Matchmaker was invented by John Wirth, the owner of Woodworkers Supply. 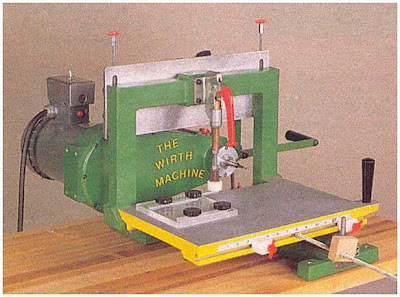 The Wirth Machine had an integrated motor, which was replaced by a universal router mount when in 1989 the tool was re-patented and re-christened the Matchmaker. 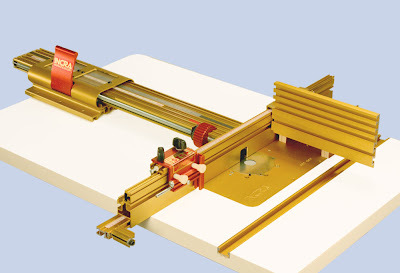 With an X-Y sliding table and a vertically moveable Z axis, this tool follows a plastic template that produces an accurate tenon, mortise, box/finger joint or dovetail. I owned one back in the late '90s and was blown-away by its versitility. FYI: A Matchmaker which included a 3hp Hitachi router recently sold on eBay for $650. They sell new from Woodworkers Supply for over $1000 without the router. I can't believe this! 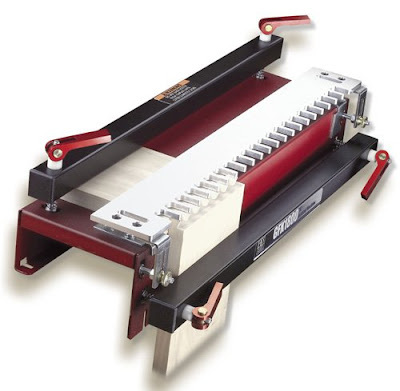 The original Wirth Machine is still available from Woodworkers Supply! They are on clearance for $1699, originally selling for $2600. The Joint-Matic was originally sold by the Strong Tool Company as the Strong Jointmatic and after Shopsmith purchased the rights to make it they took it into their R&D department and added dust collection and removed one lead-screw and the synchronizing bicycle chain. After a few years this tool was retired. There is one important thing that you need to keep an eye out for if you are shopping for the Shopsmith version of this tool. You'll want to make sure that the plastic platen that moves the router up and down isn't cracked where the knob that adjusts the backlash out of the lead-thread, threads into the platen. If you are buying one online ask the seller to tighten the knob gently and snap a photo of this detail from above. It it's cracked, take a pass. Known more for their scrollsaws, RBI used to sell a P-C look-alike jig. Now RBI offers a tool called the HAWK RouterShop, shown in the photo at right. 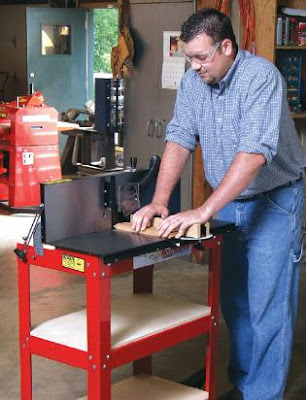 This tool combines a traditional router table with a horizontal router tool in the tradition of the Joint-Matic. 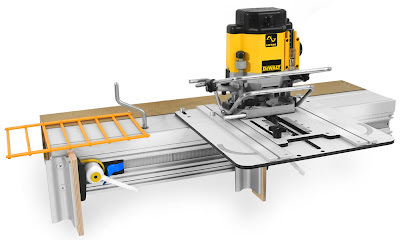 Woodhaven sells a variety of dovetail jigs including their new top-of-the-line jig (shown) that can be used in the conventional mode or on top of a router table. 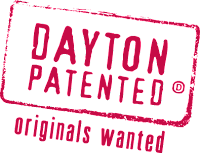 Brad Witt is the long-time owner of Woodhaven and is the inventor of many router related tools and jigs. This jig runs between $40 and $60. It works pretty well and was one of my first jigs. 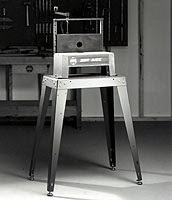 A similar jig is sold by Harbor Freight under the name Central Machine and though it LOOKS like the same tool it is inferrior in many ways including fit and finish. I suggest that you not pay more than $29 for this jig, so don't get too bid-happy on eBay! A relatively new jig that has received good reviews. It's unique in that you can clamp a tail and pin board in the jig at one time and you cut them on a router table. This ensures the alignment of the top/bottom edges and could be a real time saver if you had a two router setup like Marc Sommerfeld uses at the woodworking shows. 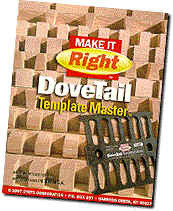 You use this template master to make dovetail and box joint jig templates. 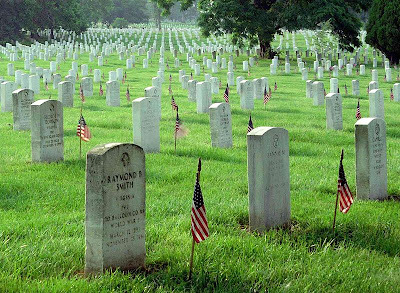 You can use it to make templates of virtually any size. It runs about $50 plus another $30 for the router bits if you don't have them. One weird thing about this jig is that when you buy it you are actually agreeing that you will honor a three page license that states among other things that you will only use it in one sop, not loan it to others, etc. It's one of the oddest things I've ever seen, but seeing that the jigs purpose is basically to reproduce itself, I guess it makes sense. As a result of this license you almost never see this jig being sold on eBay. I suspect that Stots enforces their license and that eBay honors this. The Incra and Jointech jigs are not for production work, but they work well if you are careful and patient. 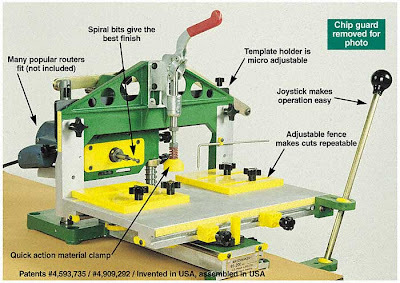 They work by positioning the fence on your router table, and are time consuming to setup and use compared with dedicated dovetail jigs.